This pungent, piquant sauce, somewhere between a dip and a dressing, is quite delicious with earthy kale – or broccoli, or almost any other robust green vegetable. If you like, you can turn it into a more substantial supper dish by cutting the kale into thick ribbons and tossing them, along with the sauce, into hot buttered pasta. The leftover dressing will keep in the fridge for a couple of weeks. Serves four, as a starter. Steam the kale or PSB for just 3-4 minutes, so it still has a bit of crunch. Toss with a knob of butter. Warm the sauce over a low heat, whisking in a knob of soft butter as it heats up. This should help to emulsify it but don’t worry if it separates a bit; it’ll still taste fine. 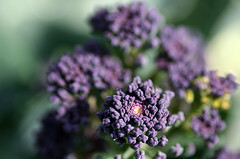 Arrange the kale/PSB on warmed plates and drizzle over a generous amount of the warmed dressing. Serve at once, with soft brown bread to mop up the sauce.